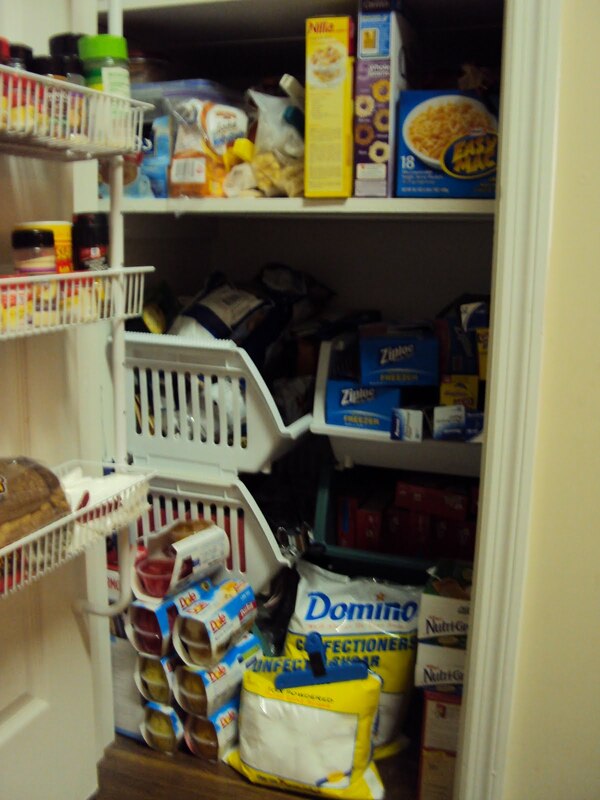 Aggies Do It Better: What's in Your Pantry? 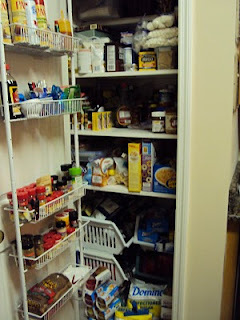 My friend Katie is (ok, well, was 2 days ago) having a "What's in Your Pantry" link-up-blog thing. This is my first time joing one of these! Ok, so, I'm like 3 days late. But here goes! Could there be any less space in there? 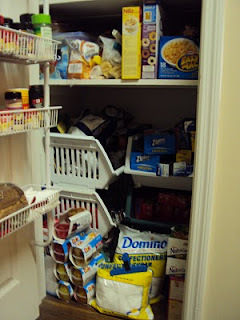 For someone who does alot of cooking, this is a tiny pantry. I do what I call "shopping ahead" at one of the grocery stores here. They are too expensive to shop at all the time, but about a year ago I started doing a little homework and realized that the coupons in the Sunday paper usually add up with their "Buy one get one free" sales. I wind up paying 1/3 of what it would normally cost at Walmart. So I spend about 20% of our weekly grocery bill there and wind up getting 3x the amount of groceries as what I actually paid for. Hence, the 8 bottles of cooking spray. Also note the ginormo bottle of vanilla extract. Sams! 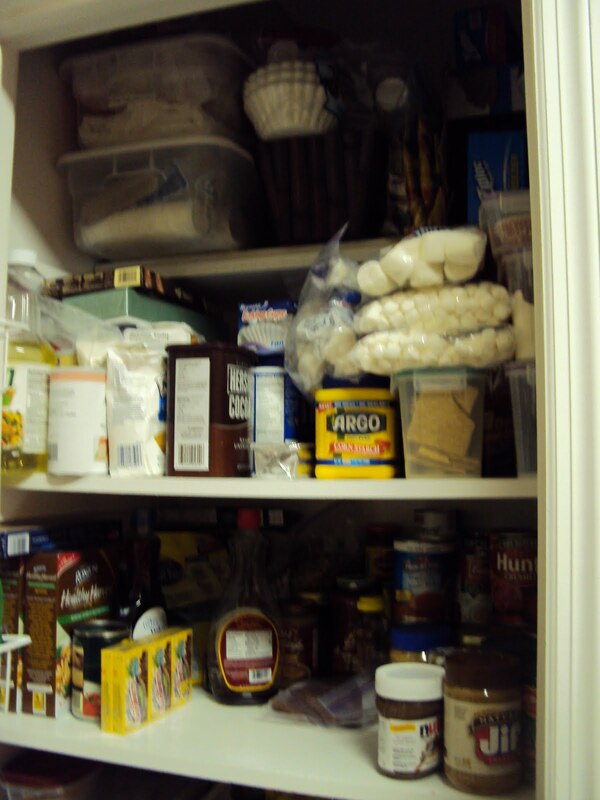 The top shelf is my "baking stuff". And yes, we do like marshmallows, but those bags are to make fondant with. Bottom: cans, etc. Note the "healthy" pasta and peanut butter. We're trying, people. More "shopping ahead" (fruit cups), more ginormo bags of powdered sugar (Sams! I use it for fondant and frosting). Chips, cereal, ziplocs. All necessities! Also, there's about 15 boxes of cake mix in there just above the powdered sugar you can't really see. 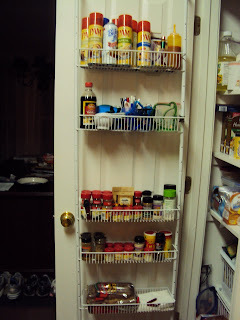 This isn't really part of my pantry but I think it's funny. 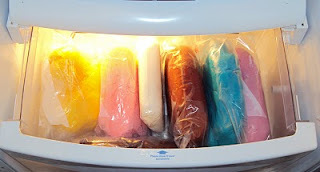 We have a fridge outside in the garage and the bottom drawer has become my "fondant drawer" . Any time I make a batch, I tint the whole batch because it's so much easier, so I am developing quite the rainbow! Pretty rainbow! How long can fondant be frozen for? I used some for my little boy's birthday cake, but I left it outside the fridge...didn't know you could freeze it. Dang girl! Thats a lot of baking stuff!